TERRASSE is located at 21 - 35 TERRASSE LANE in district 19 (Hougang, Sengkang) of Singapore. TERRASSE is a 99-year Leasehold Condo development consisting of 414 units. TERRASSE is completed / TOP in 2015 (estimated), developed by MCL LAND (SERANGOON) PTE LTD.
Educational institutions like LYCEE FRANCAIS DE SINGAPOUR, HILLSIDE WORLD ACADEMY, DPS INTERNATIONAL SCHOOL, ROSYTH SCHOOL, XINMIN PRIMARY SCHOOL and HOUGANG PRIMARY SCHOOL are near to TERRASSE. 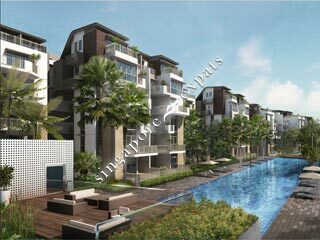 TERRASSE is accessible via nearby KOVAN, HOUGANG and SERANGOON MRT Stations. Free shuttle to Serangoon MRT and direct access to many buses, including 10 minutes to the French school. Beautiful pools. Nice apartments, but some layouts offer too many balconies, which is a loss of space.